Zacharias and Elizabeth 1913–14 is a large square oil painting by the British artist Stanley Spencer depicting the biblical story of the two titular figures that is featured in Luke’s Gospel. In the foreground of the composition is Zacharias, an elderly male figure dressed in white who is holding a pair of tongs over a flame, while another aged male, also wearing white – the Archangel Gabriel – approaches him stealthily from behind. The figure of Zacharias is also repeated in the background of the painting: behind a wood and metal fence, staring blankly outward while the auburn-haired Elizabeth stands to his right with her arms outstretched. A large, smooth, curved wall divides the painting vertically, separating these two scenes. The figure of Elizabeth appears again behind the wall, with only her upper body visible. Two further figures are also depicted in the painting: a gardener who resembles traditional representations of both Jesus and John the Baptist is seen at the right dragging an ivy branch, a conventional symbol of everlasting life and Resurrection, and an unidentified woman wearing a dark claret dress kneels behind a gravestone while touching the curved dividing wall with her right hand. The story of Zacharias and Elizabeth occurs at the beginning of Luke’s Gospel. The priest Zacharias is visited by the Archangel Gabriel while he is making a sacrifice by burning incense in the Temple. Gabriel tells him that although his wife Elizabeth is too old to have children, she will bear a son given to her by God who will become John the Baptist. In Spencer’s painting he employs a visual conceit used by early Italian Renaissance painters such as Giotto, Masaccio and Fra Angelico in which more than one scene is presented concurrently in a single tableau. As such, while the scene in the background of the painting takes place at a different time from the scene at the front, the entire story can be apprehended in one glance. Zacharias and Elizabeth was made by Spencer in 1913–14 at his childhood home, Fernlea, in the Berkshire village of Cookham. In a 1937 notebook entry the artist recounted his memories of creating the work in the crowded conditions of the rural family cottage: ‘I was a young twenty-two when I painted it. It was painted in our Fernlea dining room and Pa was giving piano lessons on my right. The dining room table was tipped up to form an easel and other children were lined up along the dark paper patterned wall’ (quoted in Fiona MacCarthy, Stanley Spencer: An English Vision, exhibition catalogue, Hirshhorn Museum, Washington DC 1997, p.61). The work was made on a pre-primed canvas, onto which Spencer drew pencil sketches and gridding before painting the final scene using commercially manufactured oil paints. The artist made at least one preparatory study for the painting (see Zacharias and Elizabeth 1913–4, Victoria and Albert Museum, London), in which the trees and foliage are given a highly detailed rendering. Artist and writer Timothy Hyman has argued that an accurate representation of the Cookham countryside and its significance for Spencer as means of recovering a ‘childhood vision’ took precedence over a convincing portrayal of the biblical story of Zacharias and Elizabeth in this work: ‘[The painting’s] fusion of landscape and religion is inherently fragile. The wild vitality of the barren winter trees about to become fertile, the amazing evergreen bursting in the foreground remain more convincing than Zacharias himself’ (Hyman and Wright 2001, p.15). In 1937 Spencer acknowledged the importance of Cookham to the work, stating that ‘I wanted to absorb and finally express the atmosphere and meaning the place had for me … It was to be a painting characterizing and exactly expressing the life I was … living and seeing about me … to raise that life round me to what I felt was its true status, meaning and purpose’ (quoted in Hyman and Wright 2001, p.93). Keith Bell, Stanley Spencer, London 1992, pp.16, 22, 27, 29–30, reproduced p.23. Timothy Hyman and Patrick Wright (eds. ), Stanley Spencer, exhibition catalogue, Tate Gallery, London 2001, pp.13–15, 21, 33, 70, 74, 93, reproduced pp.92–3. 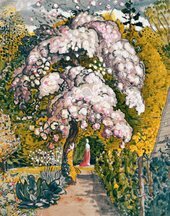 Stanley Spencer: Love, Desire, Faith, exhibition catalogue, Abbot Hall Art Gallery, Kendal 2002, pp.20–1, reproduced p.21. In St Luke’s gospel, Zacharias is sacrificing in a temple when he is visited by the archangel Gabriel. Gabriel tells him that, although his wife Elizabeth is past childbearing age, she will bear a child from God. He will grow up to become John the Baptist. The support is one piece of plain weave linen canvas 63 inches (1600mm) wide. The warp thread is vertical. Two circular stencils on the reverse of the canvas indicate that it was prepared and stretched by Newman, Soho Square, London. The canvas was primed while stretched onto a loom (selvedges with the hook holes used for this remain at both vertical edges), probably after an application of glue size. The priming is an oil type of pinky buff colour which covers the whole canvas except the area close to the selvedges where it was attached to the loom. The priming is moderately thick but retains the texture of the canvas weave. After being removed from the loom the primed canvas was stretched over a seven member, pine wood stretcher with mortise and tenon expansion joints and keys (now taped). Steel tacks were used to attach the painting to the edge of the stretcher and are still mainly in the original locations used by the colourman. The artist appears to have used commercially manufactured artist's oil paints and pencil drawing to create the image. The paint was applied by brush over the whole of the stretched canvas face. There are signs of squaring up with pencil lines, visible for example in the face of Zacharias. The artist has also drawn with pencil into the wet paint in a few areas. The paint is generally of a medium thickness, but there are some areas of slight impasto. It is generally opaque and applied in few layers, sometimes leaving the pinkish buff priming to show through at the edges of forms. In other areas however the application of paint is more complex and layered, for example in the grass at the bottom left, where a brown paint has been used to tone down the green grass painted beneath so that it appears to be deep in shadow. There is evidence of reworking in several places for example the contours of the central wall. The painting has a recent synthetic varnish with cosmolloid wax added and inspection in ultra violet light shows that it also appears to have a thin and uneven layer of natural resin varnish, with some runs which indicate that it was applied while the painting was vertical. It is not possible to say without further analysis whether this earlier varnish could have been applied by the artist. Some varnish has penetrated through the cracks in the priming to the reverse of the canvas, but this could be the more recent varnish. The painting is in fairly good condition. There are no major losses or damages but the painting is structurally very delicate. The stretcher is slightly flexible because the joints have been keyed out and there is some warping of members, but there are no major defects. The canvas has degraded with age, slackened slightly and follows the elevation of the crack edges. There are several small distortions along the bottom due to debris behind the stretcher bar. There are no major damages although the tacking margins are generally worn and have minor tears at the corners. The paint and priming at and near the edges are also worn and cracked with numerous small losses, probably due to frame abrasion. There are many areas of linear, branched cracks with elevated edges extending through the priming and paint but generally the adhesion between the priming and canvas appears good with only limited areas of cleavage. However, the paint has a tendency to small scale flaking between layers of paint or of paint from priming and there are many tiny flake losses, some of them restored. There is a white efflourescence consisting of tiny white lumps similar to that in the Cookham Resurrection of 1923-7, particularly visible in the darker areas of paint. Some of the paint also has a misty bloom, for example, in the dark green of the tree at the bottom right. The varnish is not very thick or glossy. It is rather uneven in appearance leaving the paint looking matt in many areas. It may have discoloured slightly. There is a noticeable layer of dust on the front of the painting and the tacking margins and the reverse of the canvas and stretcher are also dirty. The reverse is stained by varnish that has penetrated through the crack apertures and also has patches of extraneous paint. The painting has a carved, softwood, oil gilt frame. The frame has an applied plain back edge, torus knull, step into large falling ogee with large stylised leaf repeat carved as a frieze (the leaf shape is similar to art nouveau style). A caveta rises into small torus, fall to tania, step and caveta sight. Three of the corners are mitred and keyed, but at the top right there is one half-lap corner (original). This indicates that the frame has been cut down to fit the painting. There is no evidence of re-gilding. The frame has a substantial layer of dirt, especially on the bottom section. It also has minor surface damage from impacts and some whiting loss on back edge.